Its large shape is distinctive from other pistachio kinds. Delicious crispy taste and lightly salted to keep the sodium low. Excellent sources of vitamin-E, B-complex groups of vitamins. By buying this product you can collect up to 78 loyalty points. Your cart will total 78 loyalty points that can be converted into a voucher of ₹ 15.60. 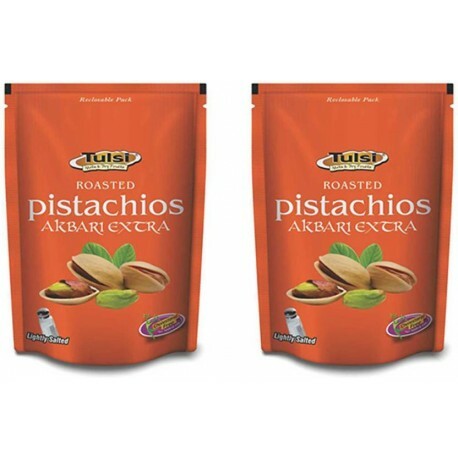 Tulsi Roasted Pistachios Akbari Extra is the Best quality product from the house of Tulsi. Akbari is one of the best pistachio varieties with highest in the nutrition value. Its large shape is distinctive from other pistachio kinds. 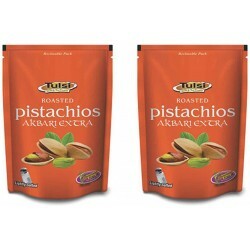 The finest of these pistachios made into a wonderful and tasty snack. Children and grownups alike relish these pistachios. Best as a serving for an evening snack or anytime munch. A 28-gram serving of pistachios contains good amounts of fiber, protein, potassium, zinc, phosphorus, vitamin B6, and manganese. They have a rich and nutty taste, and they contain other important nutrients too. The antioxidants in pistachios are some of the highest amongst nuts.